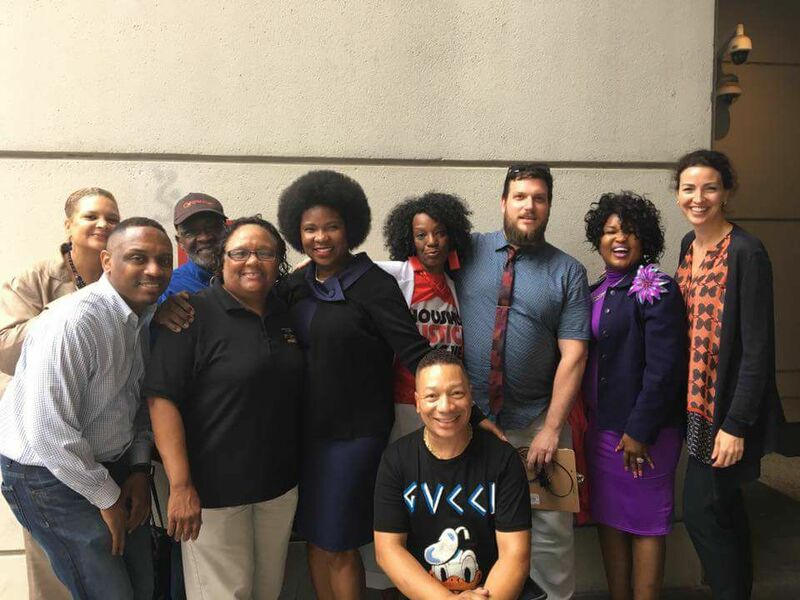 (APN) ATLANTA — The City of Atlanta’s case for seizing the home of Tanya Washington, of Atlanta’s Peoplestown neighborhood, by eminent domain fell apart in court on Tuesday, June 06, 2017. Fulton County Superior Court Judge Craig Schwall heard the case. Some thirty activists from the community came to participate in a press conference before the hearing, as well as observe the proceedings. The City has argued for some time that it needs to take Washington’s home because it proposes to create a park with a pond that could retain additional stormwater. Washington is seeking for the court to set aside the City’s declaration of taking of her home. After threatening eminent domain over the period of the last few years, nearly all of the homeowners on an entire square block–except for three–accepted offers from the City of Atlanta to purchase their homes. Washington is a professor of law at Georgia State University, and is also running for the Atlanta City Council District 1 seat currently held by Carla Smith. Smith introduced the legislation that allowed the eminent domain process to move forward. Washington; Robert and Bertha Darden; and Mattie Jackson elected to stay and fight the City. As previously reported by Atlanta Progressive News, Mayor Kasim Reed decided to allow Mattie Jackson to stay after an APN report regarding Ms. Jackson, who is in her nineties, caused community uproar. The City is clearly not used to having to justify its eminent domain actions in court, seeing as how most people are afraid to fight the City in Court b- therefore, most people take the City’s offers, as has occurred in Peoplestown. “The City has a prima facie presumption that there is necessity for public use,” Judge Schwall said at the beginning of the hearing, citing State law. What this means is that the City did not have to establish through evidence that it needed Washington’s home and we would start out assuming it were true. As a result, the burden shifts to Washington to prove, instead, that the City does not need her home. 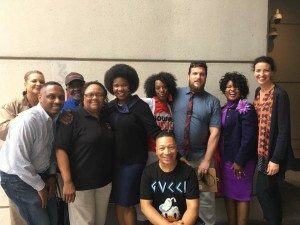 Georgia law clearly stacks the deck in favor of cities, and the City of Atlanta has abused this presumption by failing to produce a documentary record to support its case. Despite producing more than 32,000 files to Washington only days before the hearing, none of these documents established the basic objectives for the pond, or why Washington’s home specifically was needed. Nor did the City show that it considered alternatives to the pond – something it previously admitted to APN in response to an Open Records request. In fact, Washington’s attorney, Gary Spencer, presented an email written by a City of Atlanta engineer in 2014 stating that a series of previous projects–including two upstream vaults that can store water, including one at the Turner Field Media Lot–had provided more than enough new water overflow capacity to prevent future floods. “Was that email correct?” Judge Schwall asked of Todd Hill, the Interim Deputy Commissioner of Watershed Protection, who was on the witness stand. “I don’t know,” Hill replied. Hill attempted to cast doubt on the City’s own email by stating that the email’s author, Nolton Johnson, had previously stated things that were not correct. However, when asked if there was any written rebuttal to the email, Hill said no; and when asked if there were any documents to prove that Johnson had made incorrect statements, Hill said no. Spencer also asked the City about the Mayor’s decision to spare Mattie Jackson’s home. Hill admitted the City considered Jackson’s age, health, and status as a “pillar in the community” in deciding to exclude her home from the pond footprint. Hill said the City conferred with an outside consulting firm to determine the impact of excluding Jackson’s home, but that he could not remember whether he took notes regarding the firm’s findings. He said he may have written it on a sticky note, but wasn’t sure, and had no documents to produce. The court adjourned for the day after Spencer examined the two witnesses. The City and Ms. Washington will return to court on June 19, 2017. It’s time to get that state statute, referenced in the article, rewritten so that the presumption is with the property owner and the city, county, or state must prove that property taken in an eminent domain action is truly needed. Were the city building a badly needed hospital, it might garner more sympathy, but it’s attempt to toss entire blocks of home owners off their property for a pond is absurd. Some time ago, I believe I read an article somewhere discussing an alternative plan placing the pond where a parking lot/s currently sit without disturbing any homes. I wonder if I read that at Atlanta Progressive News? If so, I hope the editors will re-run, revise, or update that article. I think a lot of readers would be very interested in that information. As a new resident to this state, I am horrified to see the dirty dealings I’ve seen done to the residents of Atlanta – done to them by the very officials that they’d trusted and elected! I came here to by a house. I’ve completely lost interest that idea! Watching what Ms. Washington, and the Dardens have had to go through to save their houses from the hands of dirty politics is absolutely despicable! The worry! The fear! The very thought….! Shame on Atlanta’s Watershed Department, and all who are behind them in this attempt at this outrageous injustice! I’m quite sure that I will soon take myself and my money elsewhere! I’m sure that I will spend the rest of my days telling anybody with a set of ears, about the horrors of this case! Why would I want to live, and invest in a city that I can’t trust! These people own their homes! Well…, at least she should! They’re the ones who’s names appear on the deeds – or do they anymore? I would never want to go through what these people and their families have had to endure! It seems to me, that the “City Government” of Atlanta, is the biggest and dirtiest, most corrupt and deadliest gang in this town! Nevermind the Bloods & the Crypts – they’re hoping to be like the city government crooks one day! To come up with lies, plans, and schemes to displace folks to build a pond of all things, is ABSOLUTLY ridiculously scandalous! Everyone involved should be ashamed of themselves! I am watching you! We all are watching you! You need to make this right! We’ve elected you to represent us – because we’d trusted you! Don’t you dare let us down! Don’t you dare make these people leave the homes that they’ve invested their lives into! God Bless. For the love of God, STFU Marvin. You’re fairly new to the city? Do you know the history of this problem? Your ignorance is astounding and comical. Judging by your other posts you come across as a highly electric drama queen. Have YOU talked to the people on the other side? I haven’t heard an alternative plan from you thugs. None of you speak or represent the people in this community. Go back to where you came from. Matthew, you might want also to look at the current criminal case against Tex McIver, a Buckhead lawyer who shot and killed his wife (one of his more ludicrous excuses was that he was very fearful of Black Lives Matter). Judge Craig Schwall has been involved in some backroom shenanigans aimed at securing McIver’s release on bail. These two cases are not related, so far as I know, but Schwall’s conduct in the McIver case seems highly unethical, to say the very least. So, did the city try to take these homes because they wanted to build a pond and a park? That’s what I understood, but I want to clarify. Didn’t they use eminent domain, or other forms of intimidation, to build the Green Belt? Are they going to do the same for ChattahoocheeNow’s Vision53? These parks are being built for the benefit of large developers at the expense of the people of this city who are being priced out of their homes. I love parks and I love ponds (the Chattahoochee River is a toilet) but this isn’t how they should be built. Your assumptions aren’t correct. This isn’t about development despite Tanya trying to convince everyone it is. I don’t blame her for employing and perpetuating untruths, I might do the same if my house was targeted. This block is categorized as a flood zone. No one can develop that land. If you do a Google search on Peoplestown Flooding you’ll get a lot of references to sift through to get to an understanding on the root of problem depending on the new source. I’ll be honest with you, in the beginning of this mess I was rooting for Tanya, even contributing to her cause. When she started throwing out all these crazy conspiracies she lost me. She’s like Donald Trump spouting off to see what sticks. No one talks about the other 25 home owners who sought and got relief from sewage flooding their backyards. That’s good right? People got fair market value for their home plus 20% and moving expenses. I’m not a proponent of gentrification because it negatively affects me too. There are two sides to every story so if you’re interested in forming an unbiased opinion I encourage you to examine both sides. Where’s the follow up story to report Tanya lost her case and she dropped her bid to run for City Council? Although it’s not over, the neighbors who she’s holding hostage can gain some hope and relief that a solution to the flooding is near!! Emiment domain is a holdover from the illegal and unlawful takings and dispossession of Native American lands as the Aborigines of this Country. The Coosa people are working hard to end the unfair advantages of States, corporations, cities and counties on this issue.